Vera and Keith Anderson’s connection runs deep in the disability community. When their two oldest sons were born with developmental disabilities in the 1970’s, Vera and Keith became avid volunteers. “Our sons led us down a different path,” says Vera. “When our first child was born, I thought, we aren’t going to limit him.” Both sons now have jobs that are meaningful to them – Eric lives in Victoria while Karl resides in Langley. Vera and her husband Keith spent 30 years volunteering for Special Olympics as softball and speed skating coaches, regional coordinators and mentors. Today Vera serves as chair of the CLBC’s Simon Fraser Community Council. She and Keith are still giving back long after their sons have grown up and moved out. The Anderson’s generosity extended beyond volunteering when Vera’s local branch of TD Canada Trust nominated her for a Customer Appreciation Award. The award is given to customers who work to make their communities a better place. “One day I got this phone call that the manager had nominated me!” says Vera, still delighted but a bit embarrassed by the attention. She could assign the $5,000 funding attached to the award wherever she wanted. Together, Vera and Keith thought long and hard about where to donate the money. They knew about The Springs community re-development plan in Port Moody, which includes 55 non-market rental units. The project will also build a Tri-Cities Children’s Centre, a new church and community space. The development represents a partnership between Kinsight and SHARE Family & Community Services, St. Andrew’s United Church and Catalyst Community Developments Society. 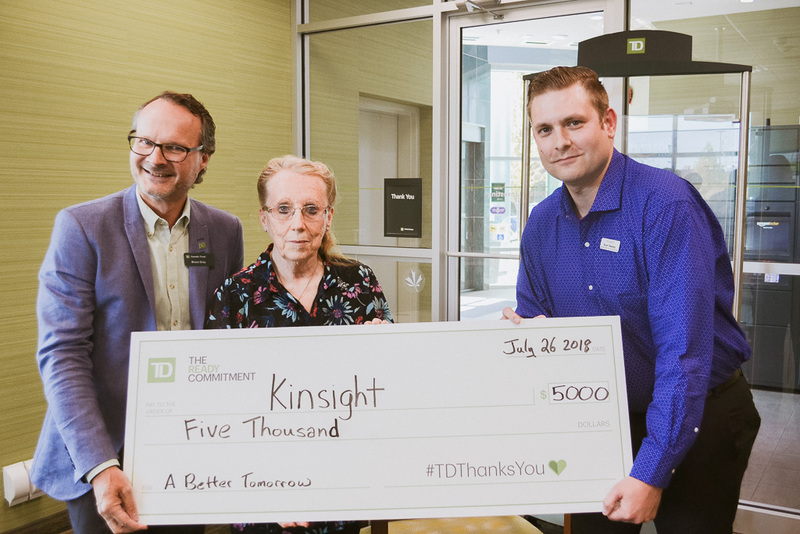 In the end, she chose Kinsight as the recipient for the funds, as she appreciates Kinsight’s investments in housing options for people with disabilities. Vera was recognized at a Customer Appreciation ceremony on July 26, where she presented the cheque to our organization. Christine Scott, Kinsight’s CEO, is grateful to families like the Anderson’s who believe in investing in their community for the future. “Kinsight has been involved with housing for decades. Our Board and staff are absolutely committed to responsible stewardship of our assets and reinvesting our equity so all people can have homes in our community,” says Christine.